Andrew Bunting, curator of the Scott Arboretum and contributor to Garden Seeds, was recently described by Susan Harris, noted blogger of Garden Rant and the Sustainable Garden blog as having “worked at all the best places in the horticultural world…” including “the famous Scott Arboretum.” These experiences have lead to a stunning home garden with unique plants that are the envy of plant collectors to novice gardeners. 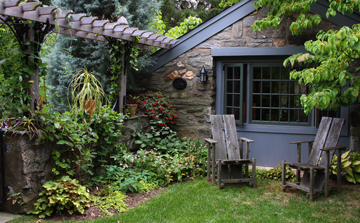 Garden Day will feature 7 other private home gardens of talented gardeners in the Swarthmore area. To learn more about Garden Day call 610-328-8025. Even his compost area is fashionable! Great phot, beautiful plants, What kind of plant are those, they are gorgeous. The one that is closest in the picture is Vriesea gigantea ‘Nova’. 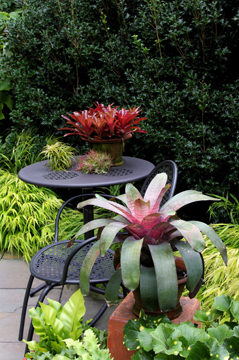 The one on the table is Neoregelia ‘Fireball’. The yellow grass is Hakonechloa macra ‘All Gold’.